NETWORK FINALS: As expected, both CW shows SUPERNATURAL and ARROW dropped 0.1 after adjustment for their preemption in NY. Elsewhere, GREY’S ANATOMY gained 0.1 in final numbers, while SWAT lost the same. CABLE HIGHLIGHTS: The night’s ratings-leading NBA PLAYOFFS games were on TNT, at 1.52/1.24. On MTV, JERSEY SHORE: FAMILY VACATION rose 0.03 to 1.01, with the 10PM AFTER SHOW at 0.41, and EX ON THE BEACH, moved from last week’s slot to a hammock between the JERSEY SHORE shows, jumped 0.23 to 0.52. On Bravo, SOUTHERN CHARM gained 0.03 to 0.46, and IMPOSTERS was steady at 0.12. On VH1, RUPAUL’S DRAG RACE climbed 0.03 to 0.39, and UNTUCKED ticked up to 0.31. On History, SWAMP PEOPLE edged up 0.02 to 0.38, and TRUCK NIGHT IN AMERICA was down 0.03 to 0.27. MSNBC’s RACHEL MADDOW SHOW eked out a cable news victory in the demo at 0.36/0.56/3.4M, with Fox News’s HANNITY at 0.35/0.61/3.5M, and CNN’s ANDERSON COOPER 360 at 0.24/0.32/1.1M. FX’s ATLANTA fell 0.07 to 0.29. Food Network’s BEAT BOBBY FLAY rose 0.02 to 0.35. 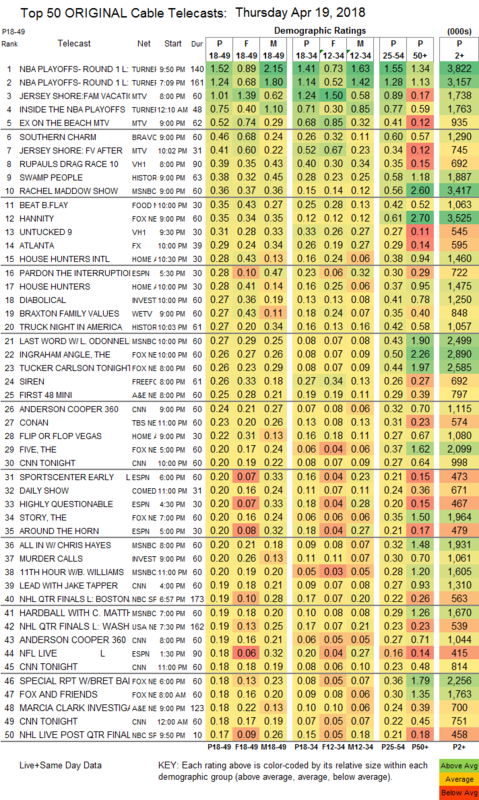 On HGTV, HOUSE HUNTERS INTL ticked up to 0.28, HOUSE HUNTERS lost 0.05 to 0.28, and FLIP OR FLOP was down 0.02 to 0.22. On ID, DIABOLICAL shed 0.02 to 0.27, and MURDER CALLS was at 0.20. On We, BRAXTON FAMILY VALUES dropped 0.03 to 0.27, and HUSTLE & SOUL was down 0.04 to 0.15. Freeform’s SIREN ticked up to 0.26. A&E’s MARCIA CLARK INVESTIGATES ticked up to 0.18. POP’s IMPACT WRESTLING lost 0.02 to 0.09. 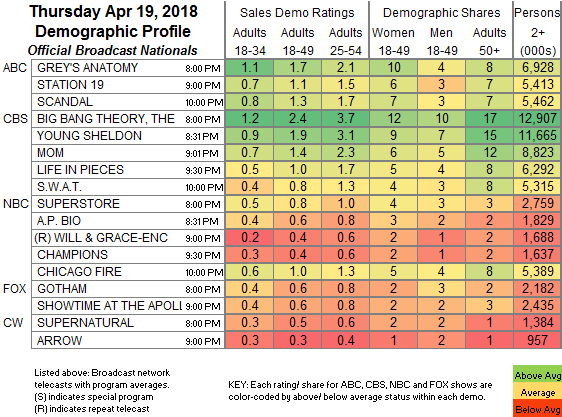 TV Land’s NOBODIES held at 0.07.